Belinda Green ’19 grew up on a small hobby farm in a small town. She fell in love with horses at a young age and began showing 4H as a teenager. 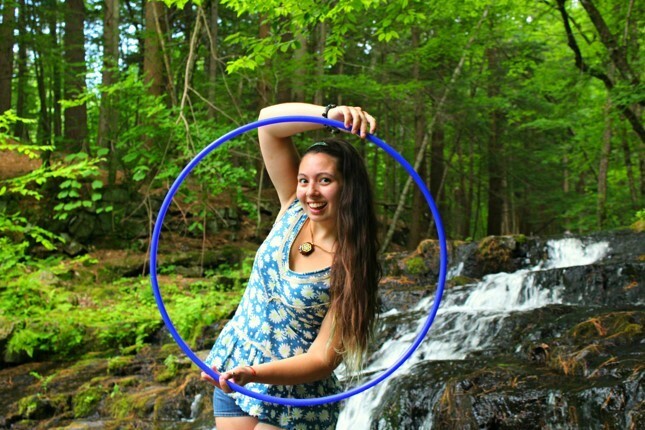 Her hobby is spinning fire and teaching hula hooping. Belinda began working at Hemphill’s Horses, Feed and Saddlery, Inc. in Vassalboro at 15 years old. She started out cleaning, working the cash register, and working in the grain room. Now, she does ordering, marketing, and general retail work in the store. Belinda graduated from Erskine Academy in 2014. She then went to Kennebec Valley Community College and received her associates degree in Sustainable Agriculture in 2016. A year later, she finished an automotive parts and service management program through Central Maine Community College. At that point, Belinda realized she was just not done learning. She enjoyed marketing through her job, so she decided to enroll in Digital Marketing Management at Thomas College. Belinda chose Thomas because it is close to home, offers an interesting program and a 4-year degree, and it’s easy to make friends here. Belinda’s dream job is to own her own small, diversified vegetable farm, focused on value-added products, and to market them to people out of state. She plans to use her Thomas College Digital Marketing Management degree to do so. Belinda likes marketing because of the implications for a business’s success. Belinda has enjoyed her time at Thomas so far because of her program.